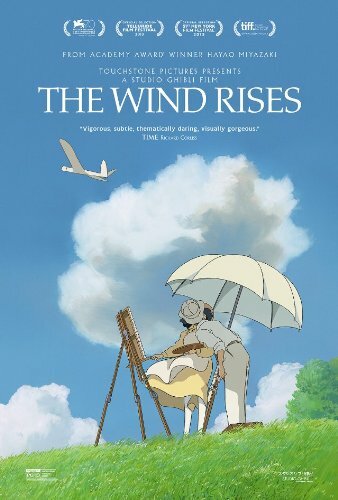 The Wind Rises is the latest feature film from animation master Hayao Miyazaki and Studio Ghibli. It tells the story of famous Japanese airplane designer Jiro Horikoshi, though it's not exactly a biography as there is definitely some fictionalization. This story starts with Jiro as a child and goes on through until he invents the Mitsubishi A5M plane. The transitions from one time period to the next can be a bit jarring, as transitions seem non-existent. One minute we're in one time period and in the very next frame we're in another time period. It takes a little getting used to. This is a very mellow film. There are good times and bad times, but very few exciting times. There isn't much action here, despite taking place mostly during World War II. Basically, it's just a story about a boy becoming a man while following his dream of becoming a great airplane designer. And of course falling in love along the way. When I reached the end, I felt both happy and sad simultaneously, which is quite an achievement for a film. The film connects emotionally very easily. The animation is beautiful, as one would expect from a Studio Ghibli film. The flying sequences were so great looking that they rivaled the 3D flying scenes in the How To Train Your Dragon films, but in 2D. Even the small details they put in are just so lovely, such as the visual distortion in eyeglasses. The sound is also very nice, but it's not 5.1 as I expected. It didn't even sound like it was in stereo. But I didn't feel at all like I was missing out. Oh, and also, a lot of the sound effects were actually done by human voices which I thought was unique. For extras, there's a Behind The Microphone featurette that features the English voice cast, storyboards for the whole movie with the original Japanese voices, and press conference featuring Miyazaki and others which is over an hour long.